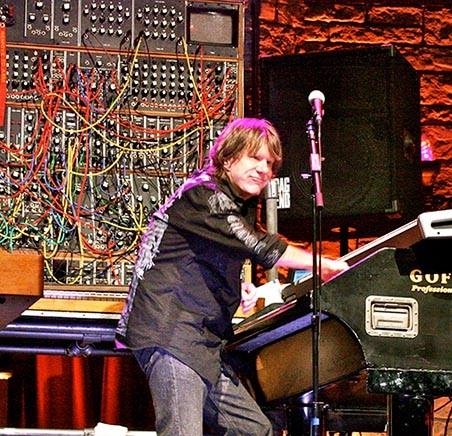 It is with a heavy heart that I pass on the news that the legendary Keith Emerson has died. First, my condolences to his family and friends. Keith was a major inspiration behind my wanting to be a piano/keyboard player. And while I never got anywhere near to his level of expertise, I always held him up as one to aspire to. But then Keith's influence reached untold thousands of would be musicians, and millions of music lovers. I always wanted to meet my hero in person, I finally got the opportunity last year at the NAMM (music trade) show. We had our pictures taken together, he signed my Piano World tote bag, Kathy shot a brief video of us together, and then he was off to another admirer. Brief yes, but so totally worth it, I was walking on a cloud for days. A good friend of ours (Kathy and mine, but also of Piano World) Jeffrey Biegel has been performing Keith's piano concerto. (It's on one of Jeffrey's latest albums) They had become good friends working on the project, two giants of the music world. So many of us have been touched by Keith, his music, his bands, his phenomenal talent. What a shame to lose him so soon. I've started a thread on our piano forums as a tribute to Keith, I would encourage you to visit it and add your own thoughts. RIP Mr. Emerson, thank you for all you have given the world! 82,000+ Forums Members, Over 2.5 Million Posts, and always growing!